Why are we so obsessed with Jane Austen? XOXO knows that book lovers are movie lovers too. BY THE BOOK author Julia Sonneborn—whose novel is a modern retelling of Jane Austen’s PERSUASION—shares some of her favorite book-to-screen adaptations. Bonus: most of them feature brooding Brits who will make you weak at the knees. 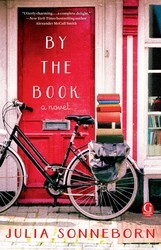 BY THE BOOK is out today! Last semester, when I was supposed to be grading exams, I procrastinated by watching all my old favorite BBC adaptations of nineteenth-century novels, number one of which is, of course, the 1995 Pride and Prejudice starring Jennifer Ehle and Colin Firth. I was a junior in college when it was first broadcast in America, and back then, no one I knew had cable (now my students get HBO as part of their dorm package, wtf), so I had to find someone who had A&E and wasn’t watching the NFL playoffs. We (my friend Miki and I) ended up watching the series with my friend Bob, who had cable and didn’t watch football and also happened to love Austen. (He’s already taken, ladies.) We camped out at his apartment for three straight evenings, and I have to say that the miniseries was perfectly pitched and cast. I thought no one could play Elizabeth Bennet, or at least play the Lizzie Bennet I’d imagined, but Ehle was perfect—her sense of humor, her irony, her self-deprecation. And Colin Firth? No words. Ok, here are some words: I love men who don’t smile, and Colin Firth spends most of the series looking grumpy and uncomfortable. Amazing. So I watched P&P, and then because I still didn’t want to grade exams, I started watching the BBC adaptation of Elizabeth Gaskell’s North and South, which came out in 2004 but which I hadn’t watched until now. And holy crap, this is an adaptation that I think is actually better than the original novel. I’ve written a lot about North and South in my former life as a Victorianist, and I think the novel is “very interesting,” as people say. Which, when I say it, means it is interesting to analyze but I think the writing is pretty didactic. The BBC adaptation keeps the grim factory-town setting and does a good job showing class conflict and the grinding poverty of the mill workers. Richard Armitage, who plays Thornton, is perfect (again, a man who doesn’t smile). And the final scene at the train station is excruciatingly awesome (when he reaches for Margaret’s hand…). Finally, this isn’t a BBC production, but Cary Fukunaga’s Jane Eyre (2011) is also a brilliant adaptation. When it first came out, I had a student who worked at a movie theater and snagged an enormous exhibit-size movie poster for me. I remember it was a dusty pink and had Mia Wasikowska in profile. I kept it rolled up for years, never having had enough room to hang it, and then I lost it in one of my many moves. I’m still kicking myself for that. Do you think, because I am poor, obscure, plain and little, I am soulless and heartless? You think wrong! – I have as much soul as you, — and full as much heart! And if God had gifted me with some beauty and much wealth, I should have made it as hard for you to leave me, as it is now for me to leave you! It’s like Jane’s interior monologue busted out into the open, and that moment is so raw and so humiliating…Bronte is a freaking masochist, and I am here for it. What about you? What are your favorite adaptations? Want to hear even more from Julia? Don’t miss her episode of our podcast! An English professor struggling for tenure discovers that her ex-fiancé has just become the president of her college—and her new boss—in this whip-smart modern retelling of Jane Austen’s classic Persuasion. Funny, smart, and full of heart, this modern ode to Jane Austen’s classic explores what happens when we run into the demons of our past...and when they turn out not to be so bad, after all.